Books, CDs, cards and beautiful original paintings for sale. The Armenian Institute is proud to host an evening honouring the trail-blazing historian and writer, Christopher J. Walker (1942—2017). His widely-read and admired book, Armenia: Survival of a Nation, led the way in presenting a scholarly, broad sweep of Armenian history to the wider public. Christopher Walker continued writing and speaking about Armenians, taking every opportunity to raise issues of minority rights and concern about Genocide denial. This evening is dedicated to Christopher Walker and his work, featuring a lecture by historian Dr Rebecca Jinks and additional short words of appreciation by fellow writers and friends, followed by a reception. Please join us in remembering this important member of our community. Photo credit: Paulina & Anna van Nugteren. Trios by Haydn, Babajanyan and Beethoven. Three exciting artists join together to play masterpieces of the chamber music repertoire. Levon Chilingirian (violin), Alexander Chaushian (cello) and Karén Hakobyan (piano) last played together at the Strathmore Hall in Washington DC at a national commemoration of the Armenian Genocide. Their rare appearances together inspire sparkling and vivid performances and display sheer enjoyment of the music and the collaboration. Don't miss this opportunity to hear the trio playing Haydn, Babajanyan and Beethoven. Levon Chilingirian launched his chamber music career with Clifford Benson, winning first prizes in the 1969 BBC Beethoven Competition and 1971 ARD Munich Duo International Competition. The Chilingirian Quartet, founded in 1971, is today one of the most celebrated string quartets on the international scene, its highly regarded repertoire ranging from classical to contemporary. Chilingirian also performs as a soloist and with other chamber music partners. Co-artistic director of the Pharos Festival (Cyprus), Chilingirian is also Professor of Violin and Chamber Music Artist in Residence at the Royal Academy of Music and Professor of Violin and Chamber Music at the Guildhall School of Music and Drama. One of the finest cellists of the younger generation, Alexander Chaushian has performed extensively as a soloist with orchestras throughout the world. He performs regularly in international festivals and is the Artistic Director of the International Pharos Chamber Music Festival (Cyprus) and the Yerevan Music Festival. A laureate prizewinner of many international competitions including the 12th International Tchaikovsky Competition in Moscow and the ARD Competition in Germany, Chaushian is an alumnus of Young Concert Artists, New York. Performing with many distinguished musicians, Chaushian’s regular chamber music partner is Yevgeny Sudbin who also partnered him on several highly acclaimed CDs. His recently released concerto CD with the Armenian Philharmonic Orchestra, received rave reviews and was selected ‘Album of the Week’ by the Independent. Described as “a musician of abundant gifts and bountiful ideas” by New York Concert Review, and “an immensely talented and dynamic performer” by Deseret Morning News, Armenian-American pianist and composer Karén Hakobyan has emerged as a versatile force on the international musical scene. Since his Carnegie Hall debut at the age of 17, he has performed in major concert halls around the world and is a top prizewinner of multiple international piano and composition competitions. Hakobyan has appeared as a soloist with orchestras across several continents and is the Founder and Artistic Director of Pegasus: The Orchestra based in New York. Christian communities in the Middle East are on the verge of virtual disappearance in the very lands where their faith was born, even as they have deep historical, theological, cultural and social roots in the region. Against the background of the deep history and rich religious roots of these communities, Dr Hratch Tchilingirian will discuss the critical challenges facing Christianity in the Middle East today, in the face of wars, religious extremism, sectarian conflicts, socio-economic decline and migration. Talk followed by Q&A and a wine reception. Dr Hratch Tchilingirian is an activist scholar. In recent years he has drawn attention to the plight of minorities and Christian communities in the Middle East, especially in academic and policy-making circles. Following his PhD at the London School of Economics, he was director of research on Eurasia at Cambridge University’s business school for ten years. Since 2012, he is Associate of the Faculty of Oriental Studies at University of Oxford, focusing on Middle Eastern and Armenian studies. Dr Tchilingirian has lectured internationally and is the author of numerous studies and articles (www.hratch.info). He remains deeply engaged in civic causes and professional projects. The London debut of contemporary Armenian folk singer Vigen Hovsepyan. Direct from Armenia. Produced by Pomegranate Music (Gor Mkhitarian/Bambir/Lav Eli/Iakovos Kolanian/Hover Choir/Harutyun Chkolyan/Arsen Petrosyan/SoloDuo) in association with Dayl'ayl Production (Miqayel Voskanyan). Born and raised in Armenia and Spain, Vigen Hovsepyan brings to life Armenian folk songs with a fresh contemporary approach. Vigen will be accompanied by noted Norwegian cellist/pianist Håvard Enstad and Armenian duduk master Harutyun Chkolyan, along with a bassist and percussionist. This concert and tour are in support of his debut critically acclaimed album entited, "Echoes: Revived Armenian Folk Songs" (Pomegranate Music, 2017). Tickets: General admission £23. Student standing room £19. Participants will use poetic and literary sources to create their own individual, emotive and creative cartoon strips. Cartoonist Rachael Ball will use her own and other cartoonist's work to explore the devices artists use to connect with their audience and to convey feelings of connections, relationships, loss and alienation. Admission: £10 to include refreshments. Rachael Ball started her cartooning career in 1988, initially doing strips for Manchester’s City Life and for '90s cult comic ‘Deadline.’ Her first graphic novel The Inflatable Woman (Bloomsbury Publishing, 2015) was one of the Guardian's Best Graphic Novels 2015 and was shortlisted for British Book Design Awards 2016. The Inflatable Woman is a surreal, poetic and comedic response to her experiences with breast cancer. She is currently completing her second graphic novel The Wolf Man which will be published by Self Made Hero and is a fictional retelling of the loss of her father as a child. You can see more of the Wolf Man on the last day of each month on her website at http://rachaelball.tumblr.com. Nare Garibyan, an Armenian-American poet joins us for one evening to talk about her latest collection of 11 poems which capture her journey through Western Armenia (present-day Eastern Turkey) with 11 friends, in 11 days, in 2005. These poems bring together the group's attempt to discover their ancestral land and understand their heritage. Nare wrote her poems in the hope that it will encourage others to explore their own cultural elements, including the truths hidden in the dark corners. The evening will include readings from her inaugural collection of poetry When Ruins Speak, followed by a Q&A. Nare will also share a slideshow of photos taken from her trip. Copies of Nare’s book will be available on the night (£15 each). Nare was born in Yerevan, Armenia and lived in Tallinn, Estonia as a young child. Growing up in Glendale, California, Nare became an active member of the Armenian community from an early age. She has a Bachelor’s degree in English from UCLA and a Master’s degree in college counselling from USC. She is currently an academic counsellor in the California Community College system. She also has an extensive publishing résumé as an editor and arts writer for Yerevan Magazine. We shall look briefly at a range of formal poetry – sonnet, roundel, blank verse, villanelle, ballad, etc. – from different cultural backgrounds, and then at contemporary free verse. Participants will be asked to pick out features that they like and dislike, in order to establish what we expect from a poem. They will then be asked to write short poems (in English or Armenian), on both a given topic and a topic of their choosing, and to share some of what they have written, whether completed or not. This is immaterial, since the aim is to gain an insight into the nature of poetry and the process of writing rather than to produce finished work. No knowledge or experience is therefore necessary, although participants who have written poetry may wish to bring an example of their work. Places are limited. Please book in advance to avoid disappointment. The sudden blossoming of a new decorative style on ceramic shapes in early 18th c. Kütahya needs some explaining. An attempt will be made at showing origins of designs by looking into Chinese, Persian, Indian and European influences. The presence of Armenian merchants on the Eurasian scene is not foreign to such influences on Kütahya potters a number of whom were certainly Armenian. Dr. Yolande Crowe is an independent scholar and lecturer on the ceramics and architecture of the world of Islam. For a number of years she has concentrated on cross-cultural exchanges across Eurasia. She is a regular contributor to international congresses and publications on Persian, Turkish and South Asian arts. The author of Les arts de l’Islam, Brussels 1976 and Persia and China, the blue and white Safavid ceramics in the V&A, Geneva 2002, she has almost completed work on an important private collection of Kütahya ceramics. This talk explores the British Empire’s response to the 1915 Armenian genocide in which an estimated one million Armenians were killed. A leading power in the region and the world at the time, Britain and its Empire played a key role in determining the global response to these events as they unfolded in the Ottoman Empire. Newly uncovered archival material on imperial policy dating back to the 19th century and war crimes trial held after WWI to punish perpetrators show why it proved impossible to stop the violence and prosecute those responsible for the atrocities despite the emergence at the timeof the category of ‘crimes against humanity’ and one of the first ever international humanitarian campaigns. From Gladstonian idealism to Churchill’s imperial realpolitik, the British response to the Armenian genocide reveals the high stakes and legacies of the failure of a global hegemonic power to lead the prosecution of the architects of one of the classic cases of genocide in the modern period. Michelle Tusan is Professor of History at the University of Nevada, Las Vegas and the author of Smyrna’s Ashes: Humanitarianism, Genocide and the Birth of the Middle East. She has published widely on the history of humanitarianism and human rights. Houshamadyan is co-organising an event with the Programme of Armenian Studies, the Centre for Armenian Information and Advice and the Armenian Institute where we will be collecting old family archives in order to digitise them. All are invited to come and take part. 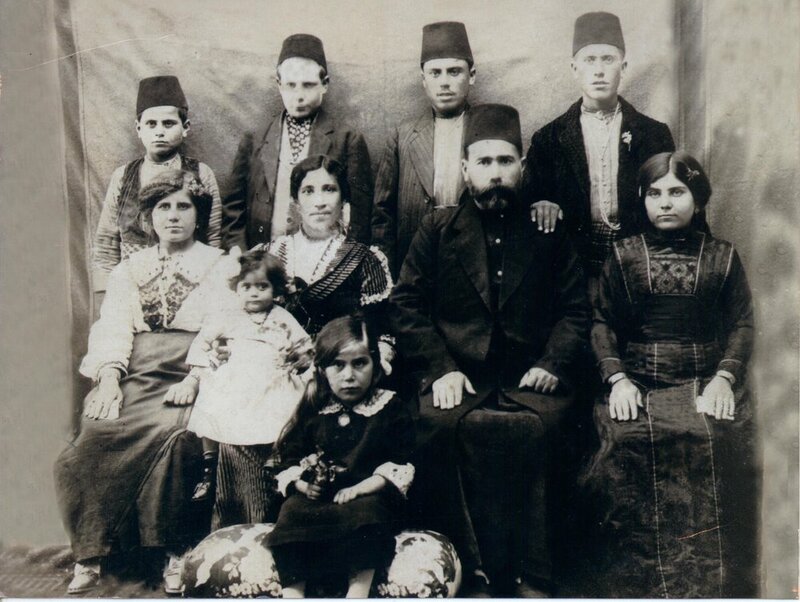 Please bring old family photographs, memoirs, religious objects, household items of all kinds from dowry items to cooking utensils, and materials pertaining to Ottoman Armenians inherited from your ancestors to Hayashen / CAIA. By sharing your family archives and family micro-histories with us, you will be helping us to reconstruct the life of all our ancestors. We also appeal to those who have materials related to World War One and Armenian literary productions such as books, letter, pictures, and oral histories from the 19th Century to the early 20th Century, to bring them in for documentation. All items will be returned immediately after digitisation. Vahe Tachjian earned his PhD in History and Civilisation at the École des Hautes Études en Sciences Sociales (EHESS) in Paris. He is now the chief editor of the Berlin based Houshamadyan website. His main publications are: La France en Cilicie et en Haute-Mésopotamie. Paris, 2004; Les Arméniens, 1917-1939; La quête d’un refuge, Paris, 2007 (co-editor); and Ottoman Armenians: Life, Culture, Society, Vol 1, Berlin, 2014 (editor). His new book, Daily life in the Abyss: Genocide Diaries, 1915-1918, will be published by Berghahn Books (NY). Dr. Elke Hartmann is a senior researcher at Ludwig Maximilians University in Munich, specialising in Modern Ottoman and Armenian history. Her doctoral thesis on Ottoman military conscription and modern statehood, Die Reichweite des Staates. Wehrpflicht und moderne Staatlichkeit im Osmanischen Reich 1869-1910, Paderborn: Ferdinand Schöningh Verlag, was published in 2016. She co-founded the Chair of Modern Armenian Studies at the Pázmány Péter Catholic University in Budapest in 2016 and the Houshamadyan project in 2010. Dr Vahe Tachjian and Dr Elke Hartmann have been invited by the Programme of Armenian Studies to talk about the Houshamadyan project on Saturday 3 June at 5:00pm in room B104, SOAS, University of London. The Houshamadyan website (www.houshamadyan.org) has existed since 2011. It is the property of the Berlin-based Houshamadyan non-profit Association. The aim of the Houshamadyan project and the website is to reconstruct the daily lives of the Ottoman Armenians and their social environment in all its facets. Alongside written articles, the Houshamadyan website utilises a great variety of multi-media tools, such as musical recordings of historic value, oral history testimonies, old photographs, pictures, old film footage, maps, podcasts and so on. Join us for a day of making music together. And sharing pizza! Please register by May 20. 5.30 pm Parents and friends are invited to attend the concert. Levon Chilingirian, violinist and leader of the Chilingirian Quartet will direct the Ensemble, assisted by young professionals. Pieces will be selected according to the instrumentalists who pre-register. Grade 4 and up. All orchestral instruments welcome. Parts will be emailed ahead. The fall of the Soviet Union has transformed musical culture in Armenia. Rabiz, an underground phenomenon in Soviet times, has become a soundtrack for pro-government rallies. For opposition-minded intelligentsia and young activists, it can be a symbol of failed transition and moral corruption, while folk dance is often believed to empower the active, engaged and patriotic citizen. The lecture examines the role of music and dance in shaping new forms of identity and citizenship by discussing: 1.) the militant-patriotic youth culture of the Karin dance network, 2.) the revival of pre-genocide folklore in Sassoun-themed music videos, and 3.) the use of rabiz music in mobilizations in support of the controversial oligarch Samvel Aleksanyan. Rik Adriaans is a PhD Candidate in Anthropology at the Central European University in Budapest, Hungary. He has been a visiting researcher at UCLA and a teaching fellow at Babes-Bolyai University in Cluj-Napoca. Currently writing his PhD dissertation on the Armenian diaspora of Los Angeles, his research interests include the anthropology of music, media and diaspora studies. His publications include an article on music video as a means of reviving pre-genocide Armenian culture in Social Analysis and a study of the role of music performances in Armenian civic activism forthcoming in Caucasus Survey. Haunting lyrical songs and music from across the cultural borderlands of Turkey and Armenia with Vardan on the Armenian flute, the duduk, and Emre on the saz, a Turkish version of the oud. The first language spoken by the ancestors of the Armenian people was Urartian, written with cuneiform characters. Many stone inscriptions have survived, but the creation of an alphabet for the Armenian language in early 5th century led to a real revolution: this very 5th century is known as “the golden age of Armenian literature”. Thousands of manuscripts were copied during the following centuries. They are precious not only for the text, calligraphy and illuminations, but also for the important information given by the scribes in their colophons. Later on, printing was quickly adopted, with the first book published in 1512. This “passion of writing” may be partially explained by the course of history: constantly threatened by annihilation, the Armenians felt they should leave a witness of their existence. Dr Claude Armen Mutafian, son of survivors of the Armenian Genocide was born in Paris. He taught mathematics in French universities for 40 years. Simultaneously he studied Armenian history of the mediaeval period, particularly the relations of Armenians with Crusaders and Mongols. He curated major exhibitions in Paris, the Vatican and Marseilles, published prolifically, and, at the age of 60 received his PhD in history. Vahan Kerovpyan and Sevana Tchakerian will lead a workshop aimed at inspiring and coaching all song-writers. Hints and practice exercises on how to turn your ideas into music will be shared with Vahan and Sevana demonstrating and coaching. Please bring your voice, your instrument (if it's portable!) and all your thoughts about that next hit song. Participants will be asked to share their work. Prepare to be inspired and to have a lot of fun. Please book ahead as we expect a crowd. MEDZ BAZAR RETURNS TO LONDON! The Armenian Institute thanks the Arts Council England, St Sarkis CharityTrust, Richard M Anooshian and Panos & Diana Katsouris for their generous support. The only serious study of cartography in Armenian appeared almost 60 years ago in 1957 by the Soviet scholar Hovhannes Stepanian, entitled Armenian Cartographic Publications of 260 Years (1695-1955). This study however contained only one low quality map and along with many other shortcomings it did not list many maps published by Armenians living outside the Russian Empire and the Soviet Union. In order to rectify this, Rouben Galichian offers in his latest book an almost complete study of the history of Armenian cartography from its inception up to 1918, including reproductions of as many maps as possible. Appearing in print for the first time are a number of maps, mainly from private collections, that have come to light through Galichian’s extensive research. The final chapter of the book also includes manuscript maps made between 1890-1968 which represent important contributions to the Armenian cartographic heritage. The author does not rule out other maps in Armenian that may exist in private collections inaccessible to the public. Rouben Galichian (Galchian) was born in Tabriz, Iran and studied Electronic Engineering at University of Aston (Birmingham). His interest in geography and cartography started early in life and developed into a serious study in the 1970s. His first book Historic Maps of Armenia: The Cartographic Heritage was followed by several other volumes on historical cartography of Armenia and adjacent regions. For his services to Armenian cartography, Galichian was awarded an Honorary Doctorate by the National Academy of Sciences of Armenia and has received the Vazgen I medal and in 2013 was awarded the Movses Khorenatsi medal for his achievements in Armenian culture. The Armenian Institute is organising a dance workshop for its current and former language students on Saturday, 1 April 2017, from 1.30 to 3.30 pm at Nevart Gulbenkian Church Hall, Iverna Gardens , W8 6TP (Tube: High Street Kensington). The workshop will be led by Shakeh Major Tchilingirian, an acclaimed solo dance artist and choreographer. The purpose of this workshop is to introduce the participants to the symbolism and meanings encoded in Armenian folk dances. No previous dance experience nor any prior knowledge is required. The single condition of participation is to communicate only in Armenian throughout the workshop; when necessary miming, facial expressions and hand gestures are allowed! Supported by the Armenian Communities Department of Calouste Gulbenkian Foundation. Armenian Communities of the Northeastern Mediterranean: Musa Dagh-Dort Yol-Kessab (Mazda Press, 2016) is the 14th volume in the University of California Los Angeles (UCLA) conference series “Historic Armenian Cities and Provinces”. Earlier volumes include Armenian Van/Vaspurakan, Sebastia/Sivas and Constantinople. This volume focusses on communities on the southern edge of Armenian Cilicia, including cultural and historic information and analysis on Alexandretta, Antioch, Beylan and the Ruj Valley, as well as chapters on each community mentioned in the title, among them a chapter on Kessab by Armenian Institute’s Dr Susan Pattie. The current war in the area brings added importance to this subject and a recent article from Granta on the invasion of Kessab is also included. Admission: £5 to include wine and nibbles. Prof Richard G Hovannisian, Professor Emeritus, UCLA, was formerly the Armenian Educational Foundation Chair in Modern Armenian History there and is currently Adjunct Professor of History at the University of Southern California. He organised this important series beginning in 1999 and has served as editor of the subsequent volumes throughout. Best known for his publications on the history of the first Republic of Armenia, Prof Hovannisian has written numerous books and articles on a range of Armenian historical topics, most prominently, the Genocide and its aftermath. The recipient of numerous awards, including the “I Witness Award” from the Jewish World Watch, Prof Hovannisian today is as active as ever, teaching and giving lectures around the world. Prof Donabedian's lecture will propose an overview presentation, abundantly illustrated, of the mediaeval arts of Armenia, including architecture, miniature, sculpture, khachkars (cross stones) and very briefly the applied arts. The Armenian Institute is very happy to be invited by the Kurdish Cultural Centre in Edmonton to present Kim Bu Ermeniler? (Who Are the Armenians? ), our children's book recently translated into Turkish. Susan Pattie will speak about the creation of the book and afterwards, Nouritza Matossian will present her film about Hrant Dink. Sunday, February 26 at 3:00. 4 Booker Road, London N18 2US.The Armenian Institute is very happy to be invited by the Kurdish Cultural Centre in Edmonton to present Kim Bu Ermeniler? (Who Are the Armenians? ), our children's book recently translated into Turkish. Susan Pattie will speak about the creation of the book and afterwards, Nouritza Matossian will present her film about Hrant Dink. Sunday, February 26 at 3:00. 4 Booker Road, London N18 2US. Armenian Community of Addis Ababa, Ethiopia, at St Mary's Church c1930. Rubina Sevadjian will give an outline of the once-vibrant Armenian community of Ethiopia, who, having had a presence in that country for more than a century, dispersed after the Revolution of 1974. The Armenians of Ethiopia were influential in the modernising of the country after the defeat of the Italians at the Battle of Adwa and the unification of the country under Emperor Menelik II. They continued to thrive under Emperor Haile Selassie I. B A Sevadjian was the jeweller and silversmith ‘By Appointment’ to Haile Selassie I. As court appointee he produced orders and medals, and made some of the most important commemorative medals and state gifts for the Emperor. R P Sevadjian is the author of In the Shadow of the Sultan, a historical coming of age novel set during the Hamidian Massacres of 1896. Sevadjian is a third-generation Diasporan Armenian whose family left Asia Minor in the 1800s and was scattered across the world, no members remaining in their ancestral homelands. Born and raised in Africa, she now lives in the UK. ARMENIAN MUSIC DAY: CALLING ALL YOUNG MUSICIANS! 2.00 Introduction to Armenian music and the day's pieces. 6.00 Parents and friends are invited to attend the concert. Pieces by composers such as Komitas/Aslamazyan and Khachaturian will be selected according to the instrumentalists who pre-register. Grade 4 and up. All orchestral instruments welcome. Please register by February 16. Parts will be emailed ahead. Armenia is home to a rich and varied corpus of prehistoric rock art, many sites beinglocated high in the mountains at elevations above 2500 meters. Recently the Ughtasar Rock Art Project set up by an Armenian-British team completed a systematic survey of nearly 1000 carved rocks within their landscape context, the spectacular caldera of Ughtasar in the Syunik Mountains of southern Armenia. At a height of nearly 3300 metres the site is snowbound and inaccessible for nine months of the year. Here are thousands of figurative and abstract motifs pecked onto the dark reflective surfaces of glaciated basalt rocks and boulders. Perhaps most striking are the wild mountain goats with massively exaggerated horns which make up 65% of the figurative motifs throughout the study area. Dating is problematic but a small number of wheeled transport motifs suggest a possible Bronze Age date for some of the carvings. Tina Walkling, BA, MA, LRPS, art historian, archaeologist & photographer, has worked in fine art publishing and as a photographer before taking up archaeology and gaining her MA at the University of Reading. She specialises mainly in rock art research. With her co-director, Anna Khechoyan, she shares a passionate interest in Armenian rock art, a sense of adventure and a love of the mountains of Armenia. She also has a keen interest in zoo-archaeology, environmental archaeology and landscape archaeology. Tina is a founder and co-director of the Ughtasar Rock Art Project. On Saturday, 11th February 2017, 6 - 10pm - £45 p.p. Places are limited so please contact info@armenianinstitute.org.uk to book. Priority booking open now for Friends, Patrons and Benefactors of the Armenian Institute. General booking from 10 January 2017. We invite you to participate in an open discussion about the challenges facing Armenians and Armenia today and the viable ways to come together and address those challenges. There are individuals and organisations already working on these challenges but not all are aware of these and often they are disconnected from each other. The Town Hall meeting is an opportunity to connect, consider possibilities and inspire action together. Format: The evening will begin with short introductions by Dr Armine Ishkanian and Dr Susan Pattie, followed by a moderated (for time) discussion. Armine will lead and moderate the discussion on poverty & inequality in Armenia and Susan will focus on creating vibrant diaspora communities. A short report will be produced and made publicly available. Members of the audience will be asked to discuss their experiences, knowledge of initiatives (successful and unsuccessful), share lessons learned, and think of ways to work more effectively. All interventions will be strictly limited to 3 minutes in order to allow maximum participation. Dr. Susan Pattie is an Honorary Senior Research Associate at University College London and former Director of the Armenian Institute. In recent years she served as Director of the Armenian Museum of America and was Program Manager of the National Armenian Genocide Centennial Commemorations in Washington, DC. Her many publications include the ethnography Faith in History: Armenians Rebuilding Community (Smithsonian Institution Press, 1997) and the children’s book, Who Are the Armenians? Dr. Armine Ishkanian is a Post-Major Review Tenured Assistant Professor and the Programme Director of the MSc in Social Policy & Development in the Department of Social Policy, London School of Economics (LSE). Her research examines the relationship between civil society, democracy, development and social transformation. She has published numerous peer reviewed academic articles on Armenia and is the author of two books, including Democracy Building and Civil Society in Armenia (2008). Please book tickets directly with the Guildhall School of Music and Drama. Born in Beirut (1939), Tigran Mansurian moved with his family to Armenia in 1947 where he received his education and musical training. His work includes numerous pieces for chamber music, voice, orchestra and ballet as well as scores for film, including The Colour of Pomegranates (Parajanov) and We and Our Mountains (Malyan). His works have been performed to great acclaim around the world and pieces recorded by well-known musicians such as violist Kim Kashkashian, saxophonist Jan Gabarek, the Hilliard Ensemble. Traditional and classical Armenian music are combined in Mansurian’s expressive compositions, bringing a personal, impressionistic approach to melody and color. Requiem, composed to commemorate the 1915 Genocide, received the Republic of Armenia State Award in 2013. 5.00 pm THE HERITAGE OF ARMENIAN WOMEN: CHALLENGES AND HOPES FROM MKHITAR GOSH, ZABEL YESSAYAN TO MODERN DAY ARMENIA. Inspired by the documentary Finding Zabel Yessayan, Judith Saryan and Danila Terpanjian partnered with the Armenian International Women’s Association (AIWA) to commission and edit English translations of her work: The Gardens of Silihdar (trans. Jennifer Manoukian), My Soul in Exile, and In the Ruins (both trans. G.M. Goshgarian). The editors write that “These three volumes contain arguably the best and most influential works of a gifted artist, human rights activist and pioneer. They provide a picture of the scope, breath and historical significance of her writing and bring the reader into a world delicately balanced between intense beauty and unpunished cruelty.” This evening provides an exciting opportunity to learn more about Yessayan as Judith and Danila read from the books and talk about the process of translation and their engagement with Yessayan’s work. Books will be available for sale. After 37 years in finance, Judith Saryan changed direction and embarked on a career in publishing, editing and writing. In partnership with the Armenian International Women's Association, she helped to publish three works in English translation by Zabel Yessayan. Judith also recently started a blog: JudyinAmerica.wordpress.com. Danila Jebejian Terpanjian is a librarian, retired from Harvard University’s Widener Library system where she held various collection management positions. Current interests are focus on activities to motivate the revival of interest in Western Armenian language and literature. Originally from Aleppo, she studied in Europe and now resides in the US. Anna Arutshyan is an activist advocating for gender equality and long lasting peace. In 2001 she founded ''Society Without Violence'' in Yerevan and works with global women's organisations. Editor or author of numerous publications, she also spearheaded the Rapid Response Unit concept for effective reaction and prevention of domestic violence in Armenia. Join us for a light supper between the talks, allowing more time for discussion with Anna, Judith and Danila. The Armenian Institute invites you to commemorate the exceptional life and achievements of Hrant Dink, which ended in his cowardly murder ten years ago on 19 January 2007 in Istanbul. Hrant Dink spoke out in his weekly Agos and in the media worldwide for the oppressed, the minorities, the fearful and the forgotten and died for his courage. He was awarded numerous international prizes including the Henry Nannen and Bjørnson Prize for peace and freedom of press and is undoubtedly one of the most radiant figures in humanitarian world history. Please join us in the beautiful and intimate St Sarkis Church for an evening of words, music and image. We will be reading with many voices from the biography, Hrant Dink, An Armenian Voice of the Voiceless in Turkey, by Tuba Çandar, a collage of his words as well as recollections, reports and tributes of those closest to him with songs by soloists from Armenia, Turkey and Britain: Suna Alan, Aygul Erce, Anais Heghoyan and Aris Nadirian. We come together to give voice without formality and hope that you may wish to join in the reading even for a few minutes. Please get in touch on the evening. Texts will be available. Organised by the Armenian Institute.